As you know species are going extinct today 1000 times faster than historical natural cycles. Our mission is to protect endangered land and those species that live on the land. So we were very excited when we read this article about the Horton Plains Slender Loris, a small nocturnal animal that can grow up to 6 inches long, thought to be extinct, being caught on camera in the forests of Sri Lanka for the first time. However, the loris maybe in trouble as a species if deforestation in Sri Lanka is not controlled. Experts say that deforestation in Sri Lanka, due to cutting down the forests to create tea plantations, was the biggest threat to the loris. 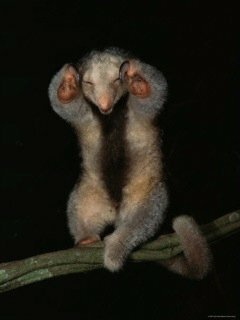 The destruction of their natural forest for both farming and logging has cut off the loris from their partners. Because they can’t move to one anther, they can’t mate and breed. 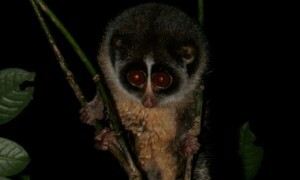 Therefore there are real implications for the survival of the loris. The Horton Plains Slender Loris is one of the world’s most threatened primates. Experts estimate there are just 100 left or even fewer. Their numbers may even be below 60 – which would make it the rarest primate species. Because for many years they were thought to be extinct, very little or almost nothing is known about them. Unless their natural habitat is preserved and we do something to protect them they will be extinct. We thought we would take a moment to discuss another part of the world where species are endangered and where biological corridors are needed. 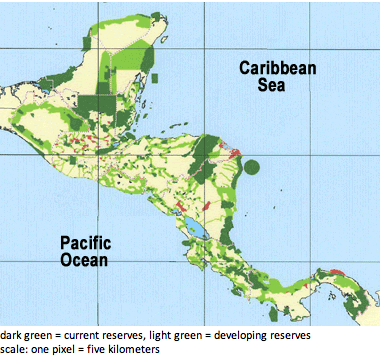 Let’s recall the idea of a biological corridor. A wildlife corridor is a route comprising a continuous, or nearly continuous, stretch of open land, woodland or water, which facilitates the movement of wildlife species, the aim of which is to prevent the genetic isolation of wildlife populations. 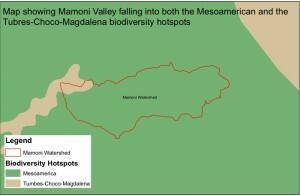 As we talked about in an earlier entry, ecoReserve is part of the Mesoamerican Biological Corridor and It was started in 1998 to keep 106 critically endangered species from going extinct. 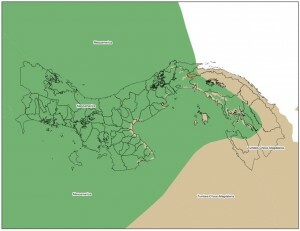 Biological corridors are required everywhere to ensure species survival. A new report out of Canada says that ” Ensuring Canada’s woodland caribou, eastern wolf and other at-risk species survival will require bigger, more interconnected parks”. This report points to the importance of biological corridors being started in Canada to protect the survival of those at-risk species and once again highlighting the importance of setting up Biological Corridors around the world as a means of protecting all at-risk species and their habitats. The report writes that “Canada’s parks are an uneven patchwork in terms of how much protection they offer endangered wildlife, and concluded the third annual review of how wildlife are faring in Canada’s parks released Friday by the Canadian Parks and Wilderness Society. The report praises the Canadian government and its efforts to create more parks, including the recently announced Gwaii Haanas National Marine Conservation Area in B.C., Sable Island in Nova Scotia and the Mealy Mountains in Newfoundland and Labrador. It also notes that other efforts such as establishing a protective zone around Ontario’s Algonquin Park and connecting parks in the Rocky Mountains have had a positive effect on species like the eastern wolf and grizzly bear. 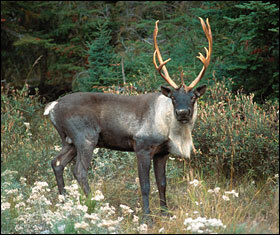 However some species (such as woodland caribou) are still struggling and this is mostly due to human activity.